On the banks of the Sabine-Neches Waterway outside the small town of Sabine Pass, TX, is a monument of sorts to the vast and rapid changes that are part and parcel of today’s natural gas sector. But it’s not a statue, museum, or culturally significant structure. It’s the Golden Pass LNG Terminal, now essentially dormant but originally built to bring Middle Eastern gas to energy-hungry America. The facility was completed in 2010 at a price tag of more than $1 billion. If that figure seems steep, consider that it’s just one-tenth of what two energy companies are prepared to spend to turn the terminal from an import to an export facility so they can meet the needs of energy users around the world. Constructed by American companies ExxonMobil and ConocoPhillips and state-run Qatar Petroleum, the Golden Pass LNG was intended to hold and distribute liquid natural gas (LNG) produced from offshore oil fields in Qatar. However, it served that purpose for only two years. It’s been idle ever since, a victim, if you will, of the surge in domestic natural gas emanating from American shale developments, which has virtually eliminated our need for Qatari gas. When it was fully operational, Golden Pass LNG employed more than 1,000 workers and utilized numerous local workers, suppliers, vendors and subcontractors. Now, the terminal has about 80 full-time employees. But the new project promises to bring a significant economic boost to the area. Golden Pass Products, as the expansion project will be known, will create the equivalent of 45,000 U.S. jobs during construction and 3,800 permanent jobs across the U.S. during operation, including 200 at the facility itself. Currently, the Golden Pass LNG Terminal is capable of accommodating 15.6 million metric tons of liquefied natural gas per year, or approximately 2 billion cubic feet of natural gas per day. That translates to nearly three percent of current US production. The terminal’s immense dual berth ship docks occupy an area large enough to hold about 77 football fields. Sticking with the sports metaphors, Golden Pass LNG’s five storage tanks are each large enough to hold the volume of 62 Olympic-size swimming pools. The tanks were constructed with 50 million pounds of steel and 5,000 valves. The terminal is designed to handle a range of LNG ships — including the largest vessels in service today, which have a total capacity of up to 266,000 cubic meters of LNG. The proposed Golden Pass Products project is expected to cost $10 billion, 70 percent financed by Qatar Petroleum. The conversion will include adding three liquefaction process trains, each with a nominal throughput (in layman’s terms, volume) of 5.2 metric tons per year, plus associated treatment, power, and utility systems, and interconnections to existing import facilities. The terminal connects to the national LNG pipeline grid via the 69-mile-long Golden Pass Pipeline. The conversion project also proposes reversing some pipelines. Although the converted facility would be intended primarily for exports, the proposed project would actually allow Golden Pass to become bi-directional, with the flexibility to import and export natural gas in response to market conditions. In other words, ExxonMobil and Qatar Petroleum are doing what they can to make sure their investment is never rendered obsolete again. 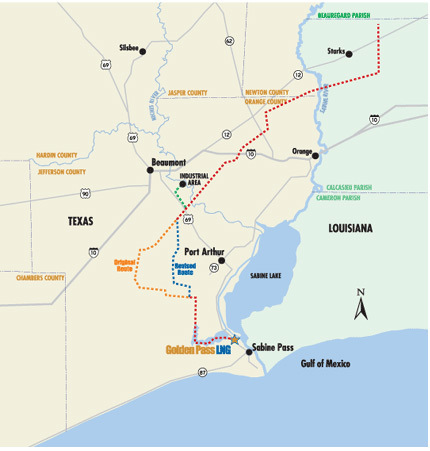 The 63-mile Sabine-Neches Waterway where the Golden Pass LNG Terminal is located is one of only a few deepwater ports along the Gulf Coast suitable for LNG carriers. Although it’s not as well known as the nearby Houston Ship Channel, the Sabine-Neches waterway is not only the nation’s fourth largest waterway, it actually tops the list for transiting bulk liquid cargo and crude oil imports. 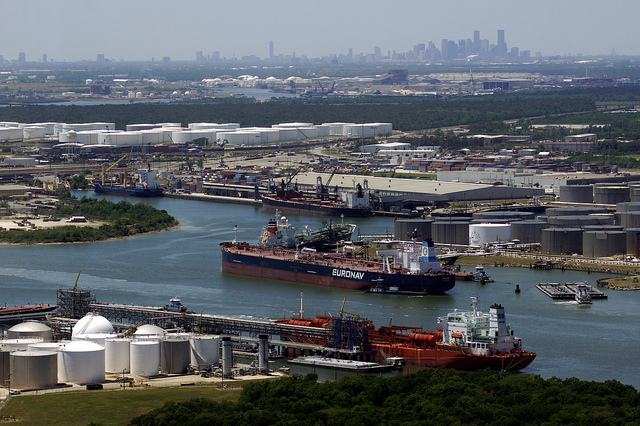 The waterway handles about 100 million tons of cargo each year (about half the load handled at the Houston Ship Channel) and supports about 288,000 regional jobs. Refineries along its shores produce a minimum of 13% of America’s daily fuel consumption, 60% of the nation’s commercial jet fuel, and most of the U.S. military jet fuel. The Sabine Pass area is also home to the LNG terminal that kicked off the export frenzy – Cheniere’s Sabine Pass facility, which is the only fully permitted new liquefied natural gas export project. It’s located on 1,000-plus acres along the Sabine Pass River in Cameron Parish, LA, on the Texas-Louisiana border. Back on the Texas side is Sunoco’s Nederland LNG terminal. This facility receives, stores, and distributes crude oil, feedstocks, lubricants, petrochemicals, and bunker oils (used for fueling ships and other marine vessels), and also blends lubricants. Environmental concerns cloud blue skies? Although the economic benefits to the community seem clear, environmental concerns may be clouding the outlook: Sierra Club has filed a protest with the US Federal Energy Regulatory Commission (FERC) against the proposed project. The Sierra Club is concerned about both direct and indirect impacts, such as emission of air pollution, discharge of water pollution, disturbance of wetlands, impacts of increase shipping traffic and the effects these issues may have on endangered species. The organization is also concerned about the increase in domestic natural gas production that will result from exports from the LNG facility as well as indirect impacts caused by combustion of LNG in end-use or importing markets. Sierra Club concluded that the Golden Pass LNG project will not deliver benefits that outweigh these impacts. However, the FERC has found Sierra Club’s previous protests against LNG export terminal projects to be unpersuasive. Worldwide, the market for natural gas is enormous and growing. Global energy demand is expected to be 35 percent higher in 2035 than it was just three decades earlier, and natural gas is projected to be the fastest growing fuel source to meet those needs. It’s believe that much of the demand will be met by supplies from North America, Australia, and East Africa, which together will put downward pressure on prices. Right now, however, Qatar is hamstrung when it comes to taking advantage of the opportunity to meet rising needs, and geography is to blame. Although the nation sits atop the world’s third largest gas reserves and has been the world’s largest LNG exporter since 2006, it may be dethroned by Australia as early as 2017. The problem is that in order to keep the peace with neighboring Iran, with whom it shares its main offshore field, Qatar has self-imposed a gas production moratorium. 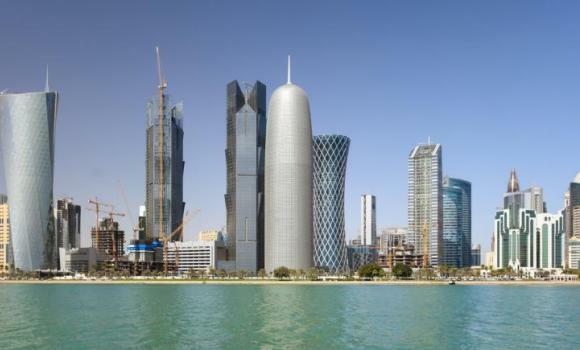 But by keeping its hand in the US natural gas market, Qatar can overcome that roadblock. The Golden Pass Products LNG Terminal would give the Qataris more gas to sell while maintaining their home-field moratorium. What’s more, they’d be able to sell American gas at the low American price. Although the project has received US Department of Energy authorization for exports to Free-Trade Agreement countries and is awaiting DOE approval to export to non-FTA nations, its formal application with the FERC for construction and operation has yet to be approved. Whatever the future holds for the Golden Pass LNG terminal, the project has maintained a goal to commit to the Port Arthur, Sabine Pass and greater Southeast Texas areas to build a mutually beneficial LNG terminal. Golden Pass LNG is also driving the business economy in the Southeast Texas area in attracting new business and retain existing jobs, as well as generating tax revenue. With such promising economy and community, it may be hard to argue the advantages of bringing the Golden Pass back to life. Is it possible that Golden Pass could one day exceed Houston’s Ship Channel success? Do you see any truth behind Seirra Club’s view on the impacts of LNG projects? What does LNG mean to America’s future?